The divine Baptist, the Prophet born of a Prophet, the seal of all the Prophets and beginning of the Apostles, the mediator between the Old and New Covenants, the voice of one crying in the wilderness, the God-sent Messenger of the incarnate Messiah, the forerunner of Christ's coming into the world (Esaias 40: 3; Mal. 3: 1); who by many miracles was both conceived and born; who was filled with the Holy Spirit while yet in his mother's womb; who came forth like another Elias the Zealot, whose life in the wilderness and divine zeal for God's Law he imitated: this divine Prophet, after he had preached the baptism of repentance according to God's command; had taught men of low rank and high how they must order their lives; had admonished those whom he baptized and had filled them with the fear of God, teaching them that no one is able to escape the wrath to come if he do not works worthy of repentance; had, through such preaching, prepared their hearts to receive the evangelical teachings of the Savior; and finally, after he had pointed out to the people the very Savior, and said, "Behold the Lamb of God, Which taketh away the sin of the world" (Luke 3:2-18; John 1: 29-36), after all this, John sealed with his own blood the truth of his words and was made a sacred victim for the divine Law at the hands of a transgressor. This was Herod Antipas, the Tetrarch of Galilee, the son of Herod the Great. This man had a lawful wife, the daughter of Arethas (or Aretas), the King of Arabia (that is, Arabia Petraea, which had the famous Nabatean stone city of Petra as its capital. This is the Aretas mentioned by Saint Paul in II Cor. 11:32). Without any cause, and against every commandment of the Law, he put her away and took to himself Herodias, the wife of his deceased brother Philip, to whom Herodias had borne a daughter, Salome. He would not desist from this unlawful union even when John, the preacher of repentance, the bold and austere accuser of the lawless, censured him and told him, "It is not lawful for thee to have thy brother's wife" (Mark 6: 18). Thus Herod, besides his other unholy acts, added yet this, that he apprehended John and shut him in prison; and perhaps he would have killed him straightway, had he not feared the people, who had extreme reverence for John. 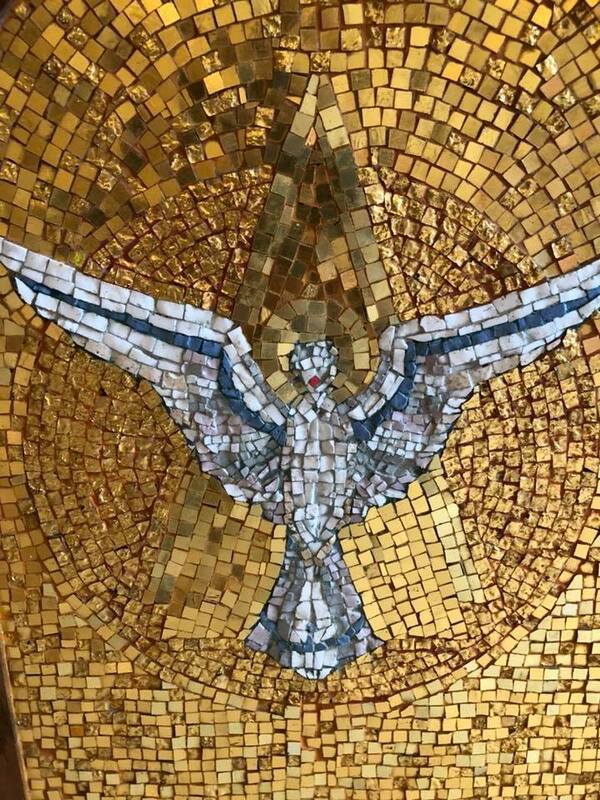 Certainly, in the beginning, he himself had great reverence for this just and holy man. But finally, being pierced with the sting of a mad lust for the woman Herodias, he laid his defiled hands on the teacher of purity on the very day he was celebrating his birthday. When Salome, Herodias' daughter, had danced in order to please him and those who were supping with him, he promised her -- with an oath more foolish than any foolishness -- that he would give her anything she asked, even unto the half of his kingdom. And she, consulting with her mother, straightway asked for the head of John the Baptist in a charger. Hence this transgressor of the Law, preferring his lawless oath above the precepts of the Law, fulfilled this godless promise and filled his loathsome banquet with the blood of the Prophet. So it was that that all-venerable head, revered by the Angels, was given as a prize for an abominable dance, and became the plaything of the dissolute daughter of a debauched mother. As for the body of the divine Baptist, it was taken up by his disciples and placed in a tomb (Mark 6: 21 - 29). 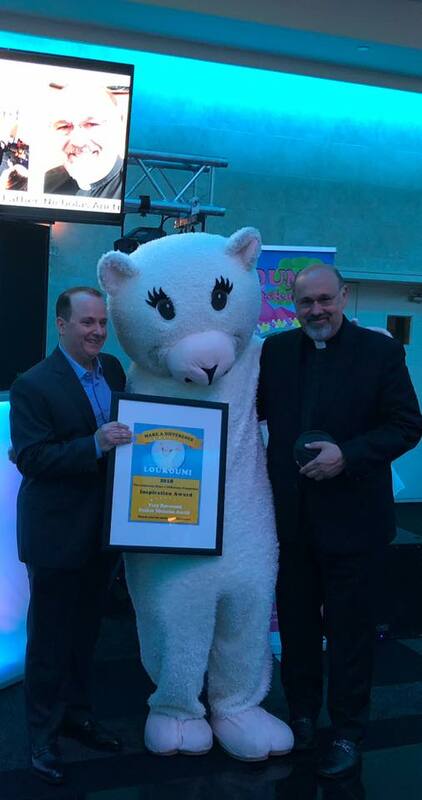 The Loukoumi Make A Difference Foundation honored Fr. 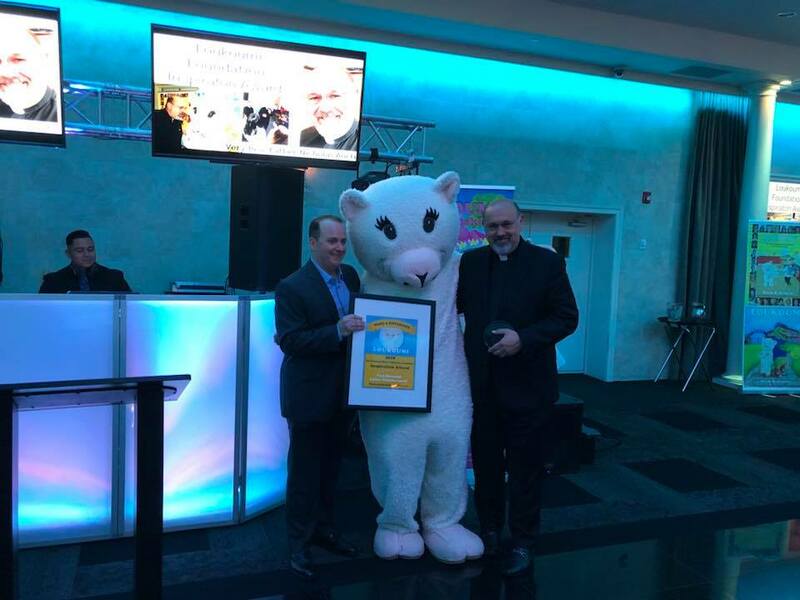 Nick with its 2018 Inspiration Award at the 4th annual Loukoumi Dance Party and Make A Difference Awards on June 15th at the Lake Isle Country Club in Eastchester NY. 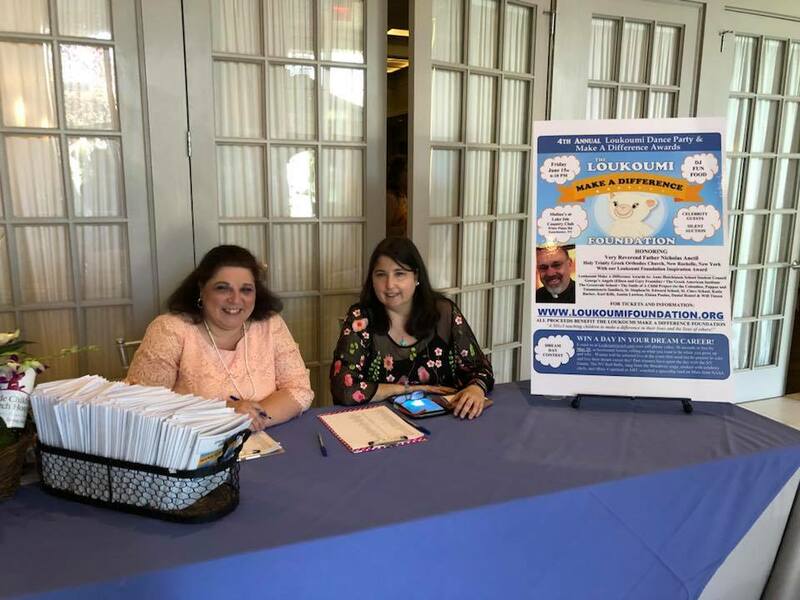 Loukoumi chairman and creator, Nick Katsoris, praised Fr. Nick as an inspiration to so many and as a person who makes a difference every day! 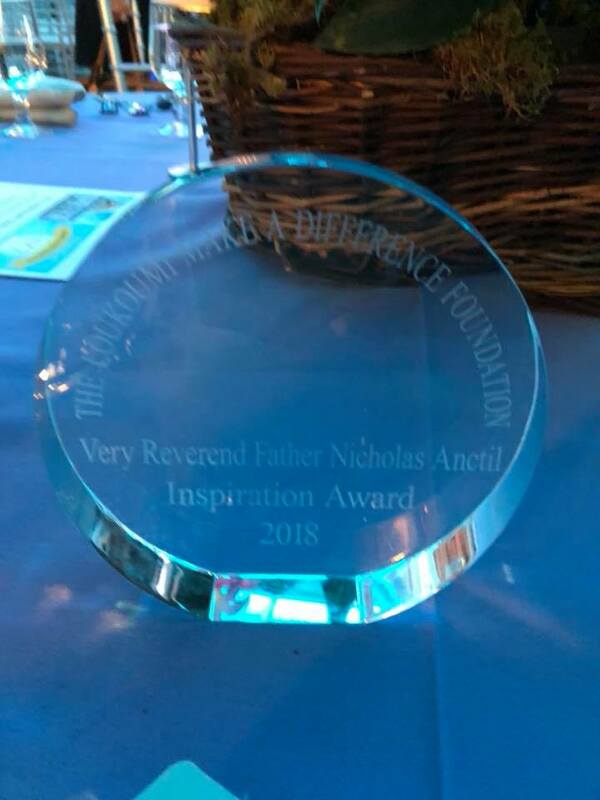 Congratulations Fr Nick! 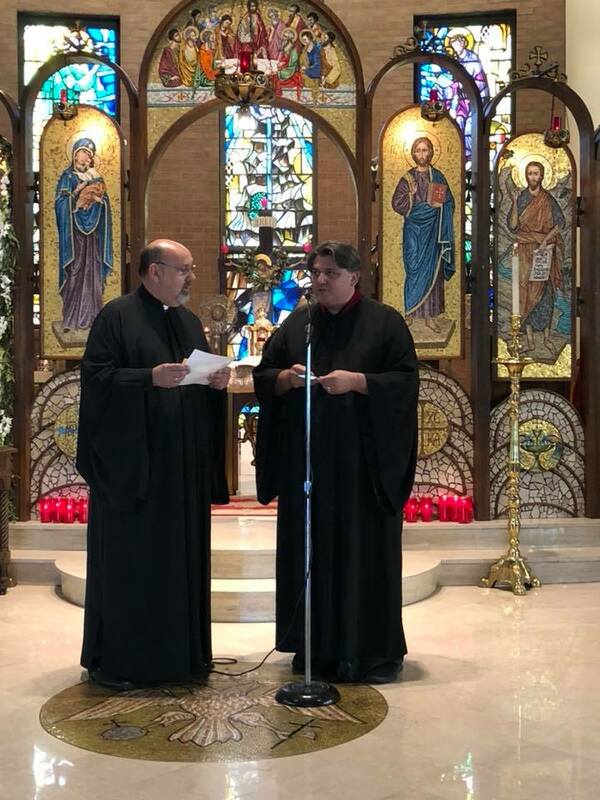 The Axion Estin Foundation presented traditional folk music at the Pentecost Panygiri in collaboration with Holy Trinity Greek Orthodox Church of New Rochelle, New York. It featured Lefteris Bournias (klarino), Giannis Apostolidis (Bouzoukee and voice), and Hristoforos Eleutheriades (accordion). 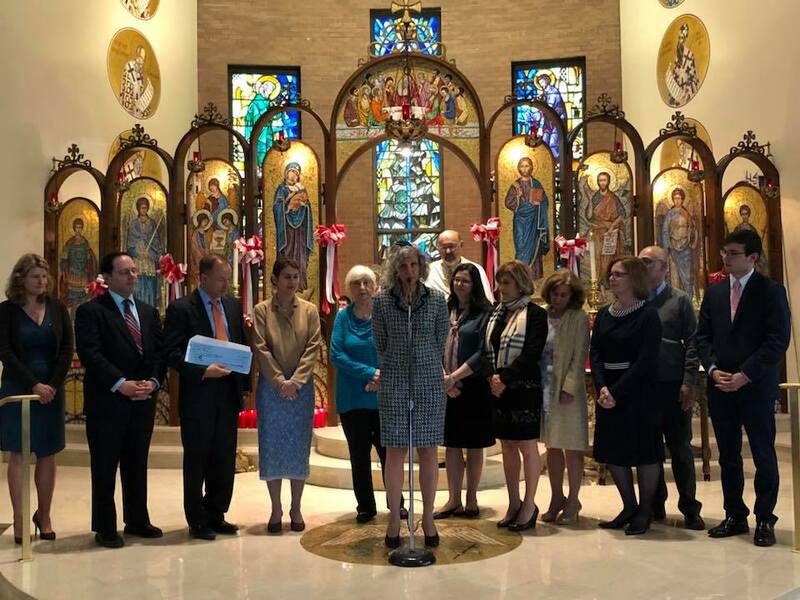 This project was made possible by New York State Council on the Arts with the support of Governor Andrew M. Cuomo and the New York State Legislature. 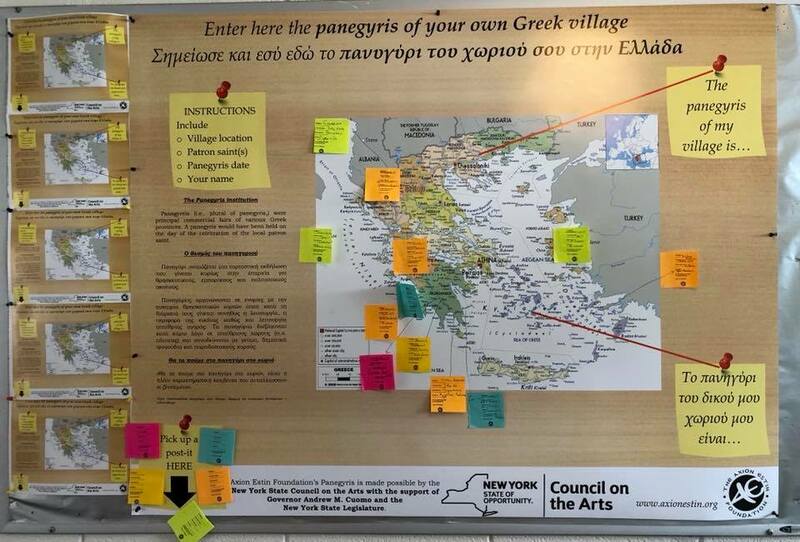 The first few post-it notes indicating location information and feast dates of Greek village Panygiris were entered earlier today. 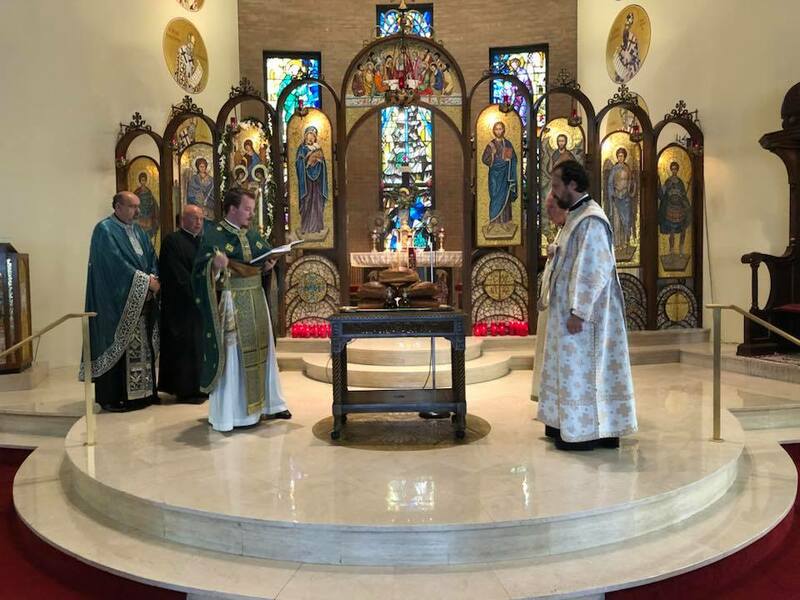 The next Axion Estin concert is scheduled for noon time, June 3rd, 2018, at Holy Trinity Church, 10 Mill Road, New Rochelle, NY 10804. 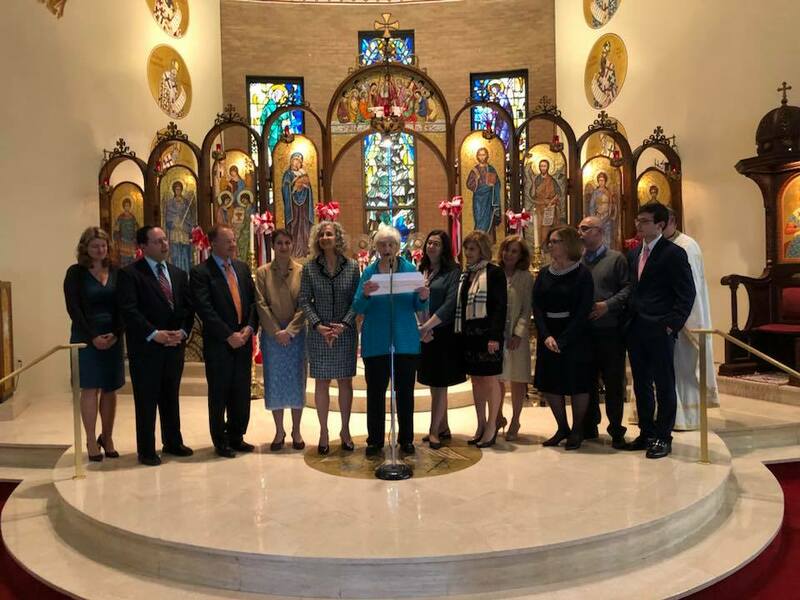 Axion Estin Foundation's Panygiris project is made possible by the New York State Council on the Arts with the support of Governor Andrew M. Cuomo and the New York State Legislature. We would like as many parishioners as possible to mark their village, church and Panygiri date. 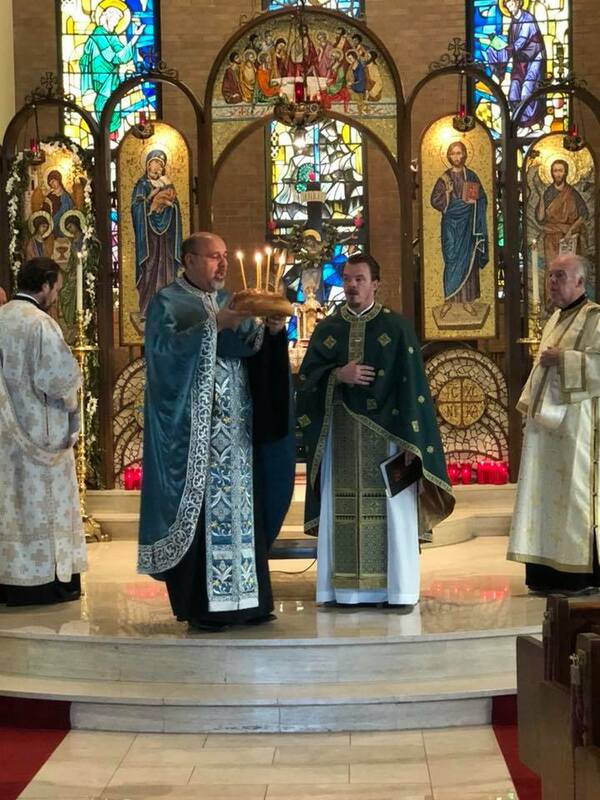 The Feast Day of our parish was celebrated this morning - Monday of the Holy Spirit - with the celebration of the Divine Liturgy. 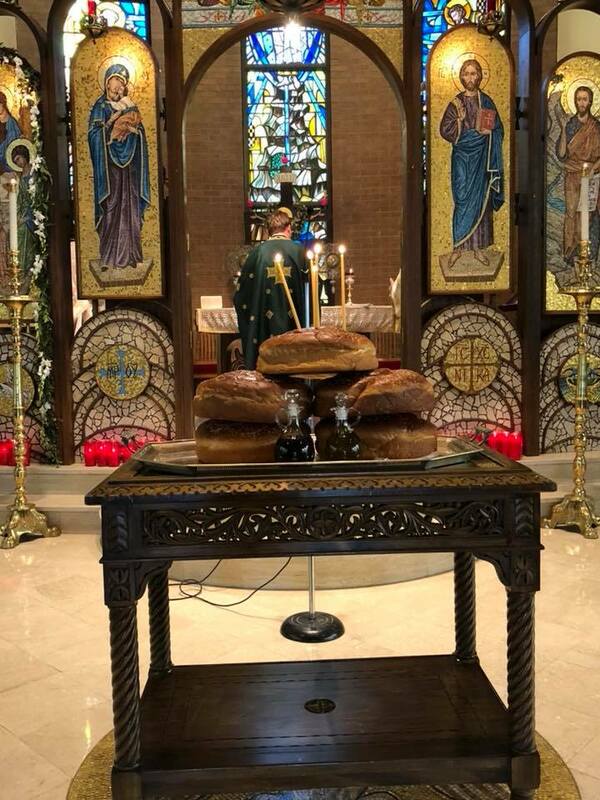 A small luncheon was offered to all who attended church and prayers were read in memory of those brave men and women - our Veterans - who severed our nation, on the occasion of Memorial Day. Χρόνια Πολλά και καλά to all! 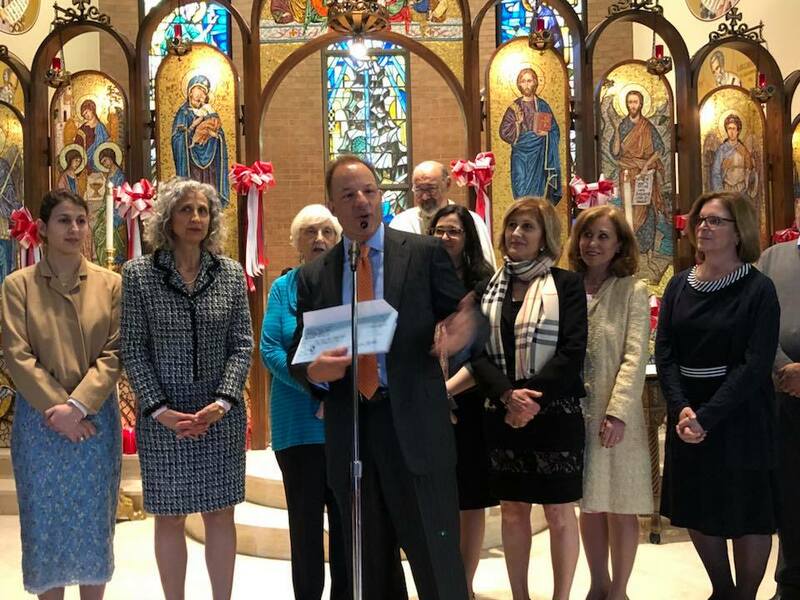 Georgeanne Mavrovitis, on behalf of the Holy Trinity Theater Group, presented a check for over $5,000 to our Dance Troupe director Nick Gregory for the acquisition of authentic Greek folk costumes (from various regions of Greece) for the dancers to dress in while performing. The proceeds were raised during the recent Taverna Night. Beautiful magnolia tree on the new property! 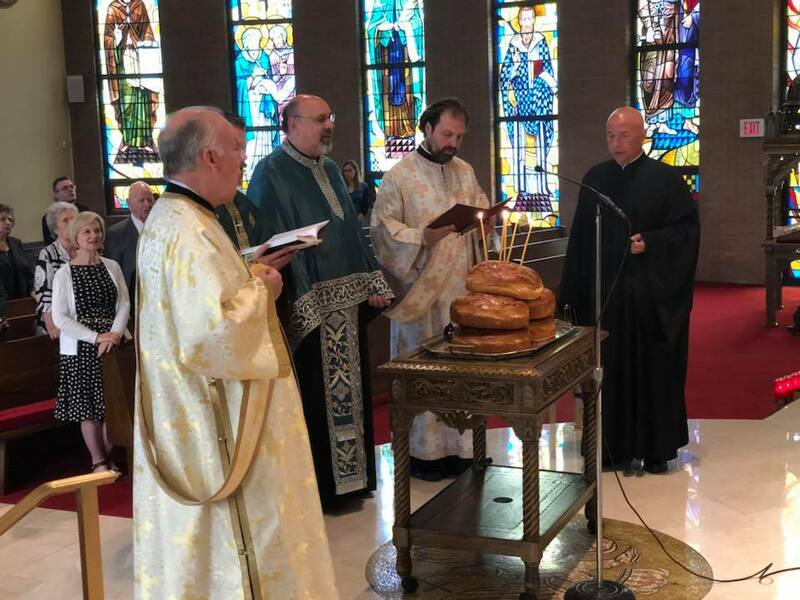 Divine Liturgy - 10:00 a.m.
Fellowship and coffee in the Social Hall immediately following the Divine Services.